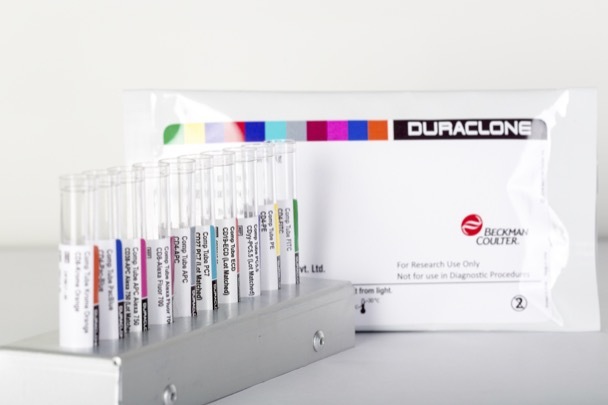 The DuraClone IM Granulocytes Tube is a 9-color antibody reagent that allows the identification of major granulocyte subpopulations including assessment of CD11b, CD16, CD62L and PD-1L (CD274) co-expression. It contains 3 Compensation Kits, each kit containing 9 tubes, each of a single color: CD4-FITC; CD16-ECD; CD33-PC5.5; CD11b-PC7; CD4-APC; CD19-APC-A700; CD62L-APC-A750; CD4-Pacific Blue; CD8-Krome Orange. All tandem dye-labeled antibodies are lot-matched.